With Pinterest and Twitter, we gave visuals and connected, but now October is our Facebook month as we continue to prep for the big December launch, and we want to hear what you have to say! We have all been a wedding guest at one time or another. Some amazing memorable stories, some fun times, and some perhaps that were along the lines of "Did Uncle Joey really just do that?!" But we want to hear some advice from you-- the wedding guest! What would be one piece of advice you would give to an engaged couple? We're looking for all types-- wedding logistics, sentimental wishes, and comical gestures! We realize this could run the gamut of an emotionally-fueled big day, so we do ask that all advice is kept to the rule, "If you don't want your Grandma to read it, then don't say it." Please keep your advice generic-- meaning no names, places, or dates. And ultimately, let's have some fun! 1. Like the “Tidewater and Tulle” Facebook page. 2. Write your advice on the Facebook contest graphic as a comment. 3. Have your pals cheer you on with “liking” your comment. The top four (4) tip givers will receive a $10 iTunes gift card and will be selected based upon the likes your comment/advice receives! You can only give ONE comment so make it a great one! 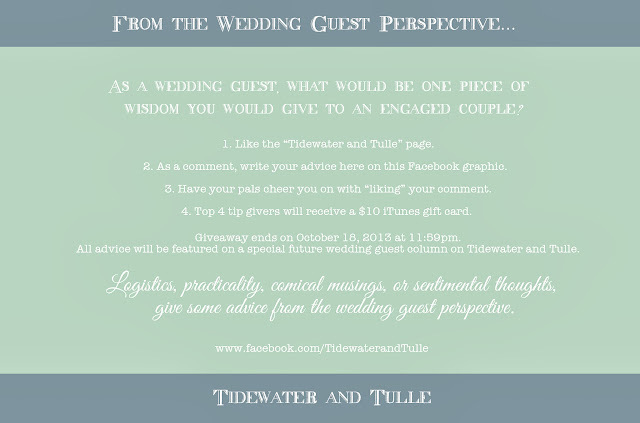 :) All advice will be featured on a future special wedding guest column on Tidewater and Tulle. 1. You must post your comment on the contest graphic on Facebook by 11:59pm EST on October 18, 2013. 2. Winners will be announced Monday, October 21, 2013 via Facebook and then notified via Facebook message for their mailing addresses. 3. All posted advice will be featured in a future wedding guest column on the blog. The legal stuff: This contest is in no way affiliated with Facebook or iTunes.